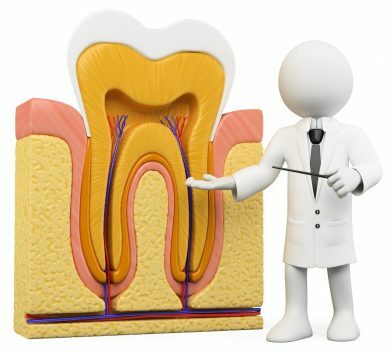 If you are having difficulty with a tooth, you may be wondering if you are in need of a root canal. This dental procedure is performed when the pulp of the tooth or the nerve becomes infected and swollen. This happens due to tooth decay or when a tooth is injured or cracked. Understanding more about the procedure and consulting with your dentist will help determine if a root canal is the right path for your tooth issues. There are symptoms associated with a root canal that you can be on the lookout for. If your experiencing tooth pain, the issue could involve the root of the tooth. Pain can range from mild to severe. The pain may lower in intensity during the day and get worse when you bite with the tooth. Sensitivity to hot or cold drinks or foods may also occur. The gums around the tooth may begin to swell or feel tender to the touch. If you are experiencing any of the symptoms associated, it is important to contact your dentist. Discovering the problem early on will ensure that the proper procedure or treatment will be provided so that the issue can be handled as quickly as possible with no further damage to other teeth. The severity of your symptoms will determine if you need to be seen right away or if an appointment will be made within the next few days. During the appointment, the tooth will be examined, and x-rays are taken to be able to determine the underlying cause. Once the examination is complete, the dentist will be able to tell you if your issue requires a root canal or other procedure. With a root canal, an endodontist will need to be seen. This type of dentist is an individual who treats the nerves of the teeth. When a root canal is needed, an appointment will be scheduled for the procedure. The procedure involves local anesthesia applied to the tooth for numbing. Small tools are then used by the dentist to access the inside of the tooth. Damage and diseased pulp are removed from inside the tooth and irrigation used to wash away any pulp that remains. After the area inside the tooth has been cleaned the hole created is then filled with a temporary filing. A permanent crown will be added in the coming weeks. Once the permanent crown is in place, the tooth is restored. Depending on the nature of the existing tooth, a supporting post might need to be added to help create more stability for the new crown. If you are experiencing any pain or unusual feeling in your teeth, it is important to visit the dentist as soon as you can. This way, the issue can be discovered, and the proper treatment provided before any other issues are created. Contact our office today to schedule an appointment if you are experiencing any tooth pain that might require a root canal or other treatment.